Everyone wants to do things faster – and cheaper. Free is the new currency for many of us in our personal lives and for the corporate IT organisation and those who supply and support them, the cost of the raw IT commodity is engaged in a frantic Race to the Bottom. Meanwhile, the business owners want to get more from their Digital Assets as they engage in a Race to the Top to achieve more growth and customer retention. As technology sellers and managers, business unit owners and end users enjoy the cut and thrust of these two opposing ‘races’ whether it is over the best deal, the best service and the best outcome, compelling and fascinating collision points appear to suggest only the strong will survive. Engineers are perfecting their science to create smaller and smaller components, that on their own matter little, but when coordinated become an extensible membrane of intelligent ‘umpf’ that can be stretched across an organisation to affect dramatic effect to business insight and corporate DNA value. Inside each of the micro-electronic components that exist in our smartphones today, and sensors that track our every move tomorrow there is a price war where the purchase price ( and production price ) is down in the weeds as the miniaturization production costs are reaching critical mass. To highlight this ( perhaps a little extremely ) there is something happening called Digital Dust which promises a complete sensor/communication system made of sensors one cubic millimeter in size. Yes one cubic millimeter in size! inventory managers placing miniature sensors on each object in the inventory system (product package, carton, pallet, truck warehouse, internet), each component could “talk” to the next component in the system. Now whilst Digital Dust may not be something any of us need to think about today, it highlights the IT industry’s march to a component based world that allows us to build computational platforms, grids and infrastructures that give our masters the power they need for their ever hungry applications and i-worker devices. And its not just the’ tech’ that is immersed in this race to the bottom. Consider the People aspect of delivering a modern IT service. through rethinking their service delivery models through automation and achieving a lower touch versus cost outcome for their ‘core IT’. At the end of the day the ‘less a user is touched by IT’ and the ‘more the user touches the information they need to be more productive’ the more ‘successful individuals and the corporate will become’. on, and the internal politics and people re-skilling programmes stutter through their traditional battlegrounds. The long tail last mile of IT ‘delivery’ still needs the people factor but the race to the bottom is at its keenest here, with the self-installation capability of the components reducing the skills level and the physical face to face ‘desk-side’ visit. Look at how Windows 10 is now ingesting itself onto devices and how the future of corporate App Stores promise more self- service facility. Over time more and more corporate IT units will be looking for the lowest price point to undertake transition work from the old style ‘desk-side’ to the new style ‘self-service’ mode of IT support. Whilst this race to the bottom is going there is also the race to the top, as organisations use these ‘low cost components’ to build up the value of their Digital Asset. Analysts talk about the Billions of business available to these who can transform their organisations by becoming Digital and big cheques are being written in search of this holy grail. And here is the killer statistic that underlines how these price wars are changing the engagement approach for all of us. can ‘mine’ client data smarter and with more revenue attached is priority number one. And all those ‘low cost’ IT actions that are needed – big data, BI tools, productivity tools, cloud – are all falling into the race to the bottom bucket in terms of acquiring the raw component. Just like Digital Dust! And all of this is inevitable. 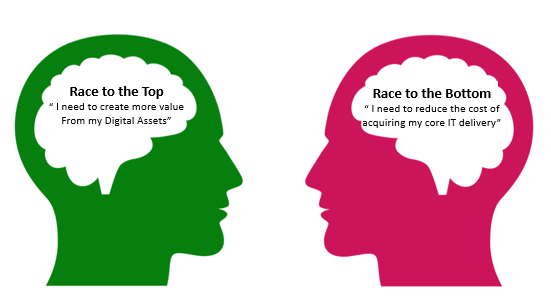 Organisations are realising in super quick time that now they have embarked on a race to the bottom for their core IT commodity assets, they can now focus their attention on the value of their digital differentiating assets. What is now of the uppermost importance is not the per unit acquisition cost of these commodity assets, but the cost of being able to take analog information that is scattered across systems and datacenters, and build insight becomes where investments are now being made. And not just in the search for better decision making and predictive analysis. And people are becoming the real differentiator as they evolve in new workplace environments, using emerging technologies to collaborate smarter and accessing business insight on their terms. So as I reflect on this post I consider how the IT world has changed 360 to a world where the most value comes from the least valuable component, and that to remain competitive and relevant having a strategy that can deliver both is fundamental whether you are the IT owner or the IT seller. I will leave it to Gartner to have the last word, as they estimate that “50 percent of all technology sales people are actively selling direct to business units, not IT departments”. Perhaps the time is coming that the ‘seller’ needs to broker more of both sides of this race, and not just where they sit comfortably today.